Alexandre Dumas’ swashbuckling classic remains as relevant to today’s audiences 172 years later as much as it did when first published in 1844. The BBC Drama production which first hit our screens in 2014 brought a fresh and contemporary take on the novel and its characters and immediately struck a chord with viewers. Inspired by the novel, events of the period and contemporary issues given an historical spin the drama has now reached a third series in a prime BBC1 Saturday night viewing slot. Composer Paul Englishby studied composition at both Goldsmiths’ College and The Royal Academy of Music. He is an award-winning composer working across a wide variety of television, film and theatre. Throughout his career he has shown a great versatility having composed the thrillingly tense music of Luther, for which he was BAFTA nominated, and he arranged the big band jazz sounds of Stephen Poliakoff’s Dancing on the Edge. He has worked on a number dramas for the BBC including Inside Men, Good Cop and Page Eight. This 2CD album contains music from Series 2 and 3 by Paul Englishby only. 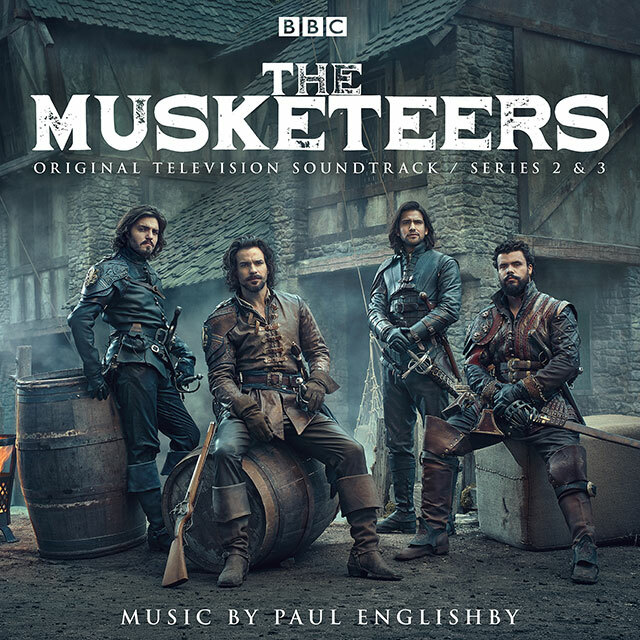 It does not include the Musketeers Title Theme Music or any music from Series 1.